Description: This line graph represents the trends in the US economy by tracking the GDP over a certain number of years. To avoid showing the data for specific years, multiple axis breaks are added on both the X and Y axes. This setting is controlled on the Axis Dialog Breaks tab. 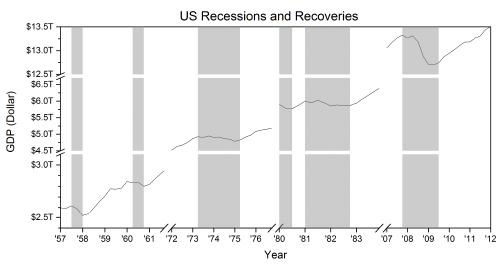 Gray bars indicating the periods during which the economy was in recession are added by enabling the Span vertically broken by missing values option on the Plot Details Dialog Line tab.